Our Blog - Westport, CT Braces - Norwalk Invisalign - Westwalk Orthodontic Group, P.C. Your orthodontic treatment is finished, you've so worked hard - Congratulations! We also want you to be able to maintain your smile. 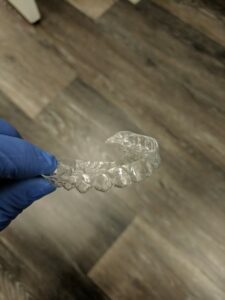 That's why retainer wear is super important! At Westwalk we use a combination of clear removable retainers and permanent retainers located behind the front teeth to help you keep that amazing smile for life. Our patients are monitored for multiple years after treatment to help them develop good retainer wearing habits. At Westwalk, you'll never be pushed out the door when your appliances are removed. And after 2 or more years or retention maintenance, we're always just a phone call away if you need us. So, make sure you're wearing your retainers as they've been prescribed, that you come in if you ever suspect a problem, and keep smiling! In the last 3 posts we've discussed that sleep-disordered breathing affects 4% of children, that it can be harmful to both children and adults, that your orthodontist works with primary care doctors and ENTs to screen patients for signs and symptoms of sleep apnea, and that for children, orthodontic appliances can aid in the treatment of sleep disordered breathing. Many adults are prescribed a CPAP machine to address their sleep apnea - most patients find that their symptoms are relieved with the combination of CPAP use and weight loss. For patients who can not tolerate a CPAP, your orthodontist or dentist can fabricate a custom-made night brace that moves the lower jaw and tongue forward. These appliances aren't always as effective as CPAP, and aren't for the most severe forms of sleep apnea, but tend to be better tolerated (especially by bed partners). To make the night brace we take a 3D scan of your teeth and plan the movement with the lab that fabricates the appliance. Several similar appliances have become available over-the-counter. Over-the-counter appliances, when not properly adjusted and monitored, can result in dental changes that can negatively affect the health of your teeth and bite. Some adult patients may benefit from a course of orthodontic treatment or combined orthodontics and oral surgery to relieve a constricted upper jaw and/or small lower jaw - these problems are addressed individually with each patient. Does your partner keep you up at night while they snore? Have you ever noticed your partner stop breathing during the night, only to gasp to catch their breath a few seconds later - all while sleeping? It is possible that he or she has obstructive sleep apnea. The field of adult sleep medicine has linked sleep apnea to high blood pressure, heart disease, stroke, diabetes, headaches and worsening of ADHD. The first line of defense when it comes to evaluating a patient for sleep apnea is a sleep study with a sleep physician. 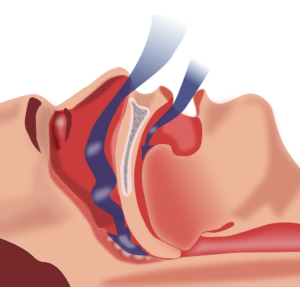 These studies can determine how severe of a problem the apnea is. As in children, the cause of sleep apnea can be multifactorial - it could be obesity, a large neck, a small lower jaw, a constriction in the upper airway or a low tongue posture. Many patients leave the sleep physician with a CPAP (continuous positive airway pressure) machine to wear while sleeping. This machine is quite effective, but tends to be bulky and loud. For many patients there are alternatives. Next week we'll discuss treatment options, and how your dentist and/or orthodontist and oral surgeon can aid in the treatment of obstructive sleep apnea. Last year an 8 year old patient, we'll call her Lilly, came to see me with her older sister who was finishing up braces. Lilly's mom was telling me that Lilly snores and suffers from sleep apnea, and was about to undergo her second tonsil and adenoid removal surgery in 3 years. Mom and I discussed the role maxillary expansion plays in helping children with constricted upper airways. (click here to learn more about expanders!) We consulted with Lilly's ENT, and he agreed to delay surgery until maxillary expansion could be completed. Just three weeks after the expander was placed, Lilly's symptoms disappeared. Lilly, Mom, the ENT and I were all thrilled and her surgery was cancelled. It's been almost a year and her symptoms have not returned. I share this story because it is a common experience that a lot of orthodontists are having. Orthodontics plays an important role in the field of sleep medicine for children and adults. Airway friendly orthodontics has changed the way I practice. No longer are we looking solely at if there is room to align the permanent teeth and correct the bite, but we are now looking at how orthodontics can benefit children medically and behaviorally. The result is a happier and healthier patient. Next week we'll start to discuss sleep-disordered breathing in the adult and why it is a concern.